From keeping your everyday essentials like milk, curd, fruits and veggies fresh for storing that chilled scoop of ice cream for a family party, a Refrigerator is an important part of your everyday life. With fridges coming in various capacities, colours and attractive designs there is one for every family. As on 25th April 2019 we have over 128 400 ltr single door refrigerator models with a volume capacity up to 400 liters under various brand names. Brands like Samsung, LG, and Whirlpool are the top choices of consumers looking for stylish designs and optimal features in a refrigerator. 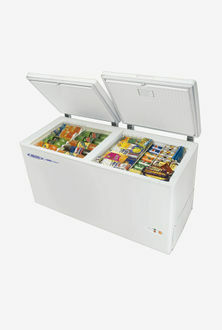 There are also options for single and double door fridges to choose from based on your need and requirements in the single door refrigerator 400 ltr range. In today's day and age, when we highly depend on automated systems, it is always preferred to go for a frost-free refrigerator that reduces your everyday hassles over maintenance. If you just searched online for 400 liters refrigerator price and models, you are likely to be bombarded with varied choices under different brands. You can just stick to hunting the online stores like Amazon, Flipkart, and the product comparison website, mysmartprice to fetch the best selling refrigerator models that will best suit your family requirements and budget. When choosing a fridge, it is important to make a note of the energy star ratings given, which indicates the energy savings and the cost efficiency of the device. So, go ahead to compare, and wisely select the refrigerator that best meets your demands on style and efficacy.